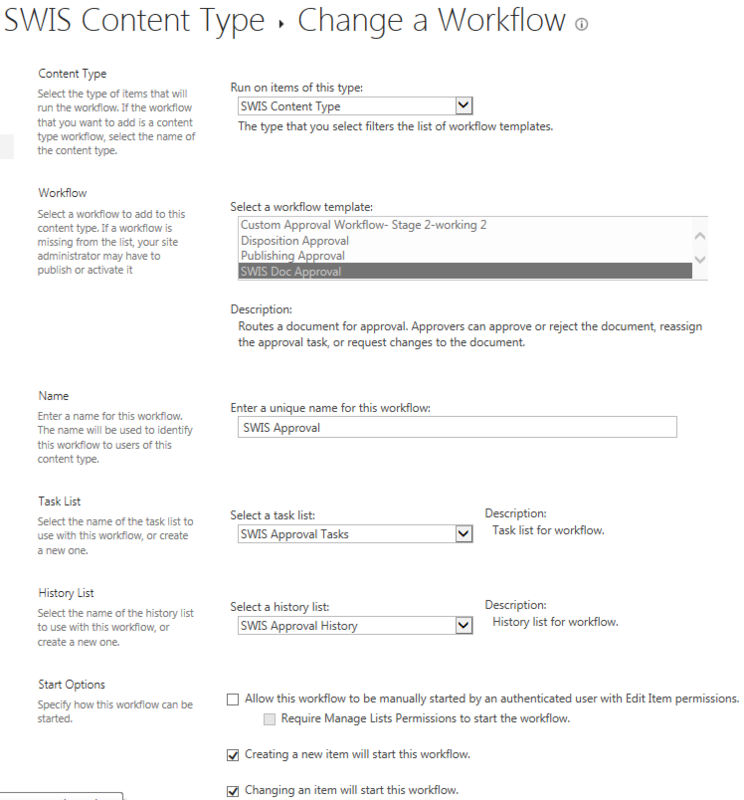 Here are the workflow settings, accessed via the Document Library settings. When I open this document library with SP Designer, I find that the Start Options here are different. I'm also a little puzzled by having the Start Options in two places - the workflow itself appears to have different Start Options. Could this be causing the duplicate approval tasks? So, then we come to the next strange issue, a weird error message. I had disabled all Start Options on the workflow itself (in SPD, I selected Workflows>Reusable Workflow>SWIS Doc Approval workflow) then I disabled all Start Options. I tried to Publish the changes and I saw this error! I've included two issues in this Question, but they do seem to be linked to each other, as far as I can tell. I'd be grateful for any pointers anyone can give or any troubleshooting suggestions. Sorry for the poor answer that follows; I couldn't find the source of the error. I deleted the workflow and recreated it by copying an existing reusable workflow. This resulted in having to rename lots of email titles and change customised email text, had to set the approvers group again. Not the answer you're looking for? Browse other questions tagged 2013 workflow approval-process duplicate or ask your own question.